This article describes a short term, day trading strategy for trading hammers and hammer reversal signals. Indicators such as moving averages, oscillators and so on are good at characterizing broad market behavior. But they do have a major drawback. They work mostly by “aggregating” price data over a certain period. This is done to remove noise and false signals. This tradeoff between noise/delay is acceptable for the longer term position trader who is trying to capture wider market trends. But for the day trader who dips in and out of the market for a period of hours or less these kinds of signals have limited use. For day trading and scalpers a difference of a few pips on trade entry can make the difference between a winning and losing strategy. What is price action? “Price action trading” simply means analyzing raw price movements instead of looking through the lens of lagging indicators. What are Hammer Candlesticks and Where Do They Form? Hammer patterns and their variants hanging men, shooting stars, and doji are among the most basic patterns found in financial charts. Easily identified, these are usually observed at reversals in the market. These patterns can be thought of as points where a change of sentiment is occurring. Figures 2 and 3 below show some classic hammer patterns. 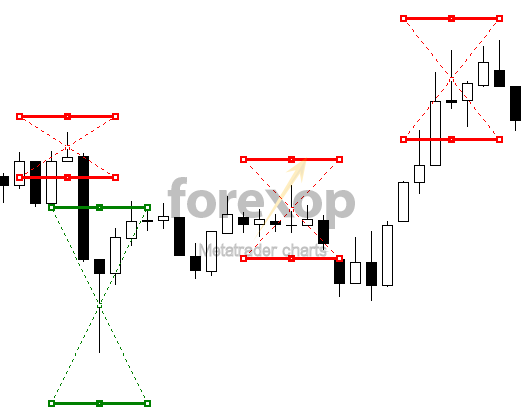 In these I’ve used a Metatrader hammer indicator to identify the hammer patterns and display them on the chart. The green markers display regular bullish hammers. The red markers display bearish hammer formations, also known as shooting stars. A shooting star has the appearance of an upside down or inverted hammer but it appears in a market that’s rising. These are considered to be bearish reversals. Figure 2 shows the characteristic appearance of hammers at market turning points. Each of these is a short duration swing within an active trend but as shown below they can mark profitable entries for scalp trades. Figure 3 shows a close up view of a three-hammer formation marking the peak-trough of a single wave. Figure 4 shows a formation occurring on a larger scale. This example shows a hammer appearing on the daily time frame as a major downtrend comes to an end. Notice also that the actual trend turning point (marked with a vertical line) is preceded by a fake hammer (#1). 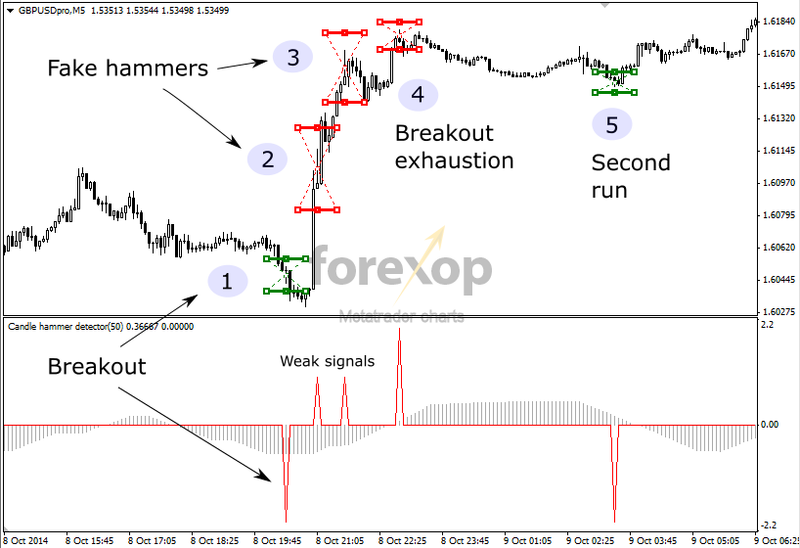 The strategy described here can be used as a scalper for both M1 and M5 timeframes. It works exclusively on the hammer/shooting star signals. 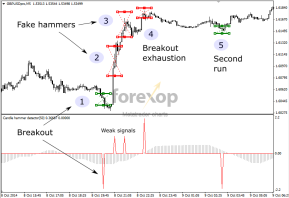 Buy side signal – hammer formation: A buy order is placed on the bullish hammer signal. To filter weak signals, I look at the accumulator line over the past n bars (where n is an input setting). This is to confirm that a trend reversal is likely to take place. This helps to eliminate entry on false signals (see additional confirmations below). 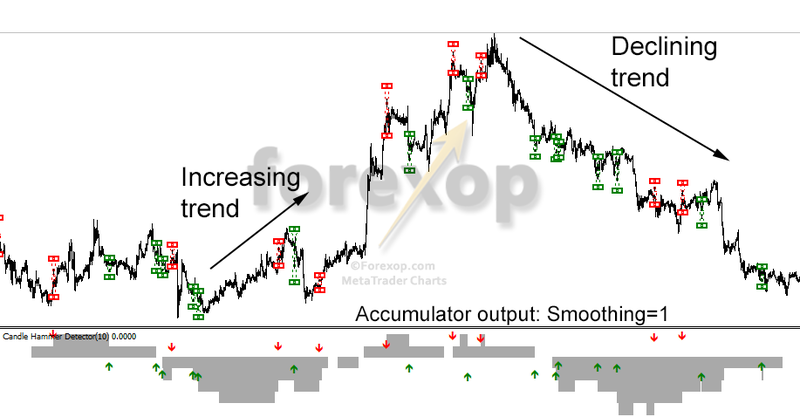 A cut threshold is used so that the buy is only taken if the accumulator is below this absolute value. 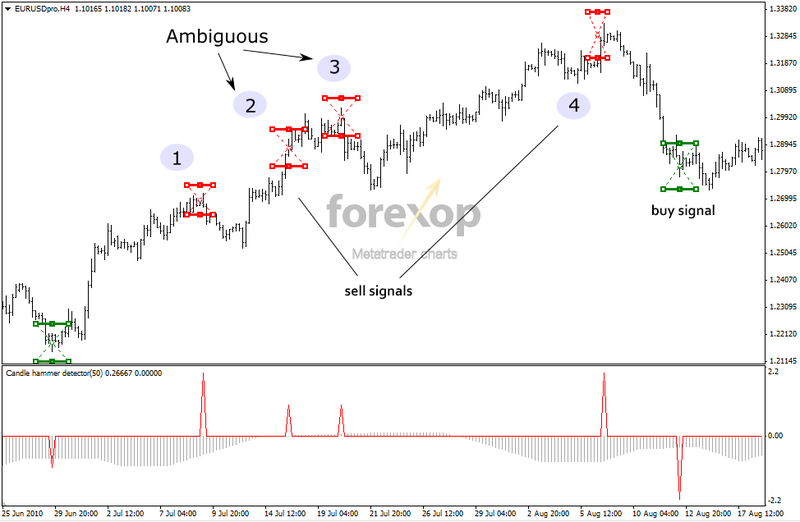 Sell side signal – bearish hammer formation: The sell side signal is basically the reverse of the above. 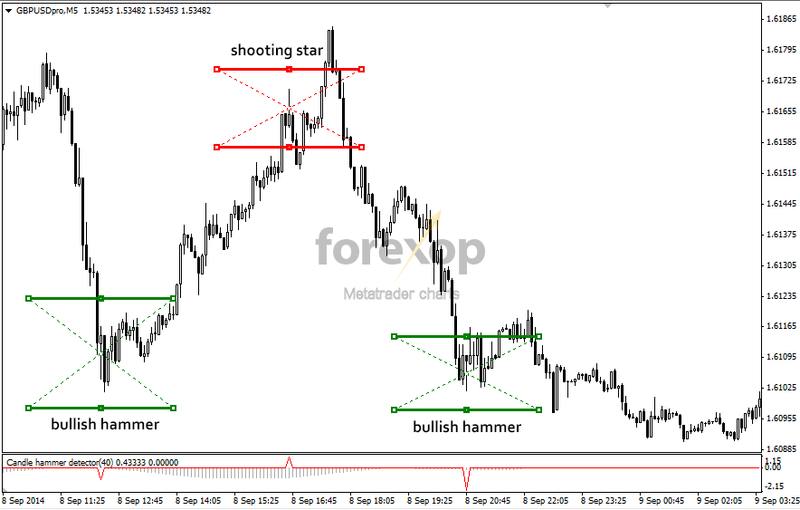 A sell order is placed on the bearish reversal hammer/shooting star providing the lot limit isn’t reached (sell below). Similarly the sell is only taken if the accumulator is above the cut threshold. An explanation of the accumulator is given below. In this strategy, I limited the exposure to one single lot placed in each order. I also prevented simultaneous long/short holdings. So if a buy signal appears when there is an open sell position, the buy is ignored. And vice versa, a sell signal is ignored where there is a current long holding. This means the strategy only holds a single position at a time. Obviously, exposure (and risk) can be increased to any required amount by increasing the order volumes or trade multiples. Raw hammer signals tend to be very noisy and using them “blindly” is unlikely to result in a profitable strategy. This is why many “raw” hammer strategies fail over the long term in my view. The hammer indicator already filters out weak and ambiguous signals. The aggressiveness of this filtering can be adjusted with input settings to the indicator. The remaining signals tend to be quite reliable. However, further confirmations can be used to check the conditions and to eliminate false positives as far as possible. The signal rises when there are a series of bearish hammers which usually happens in an up trend. 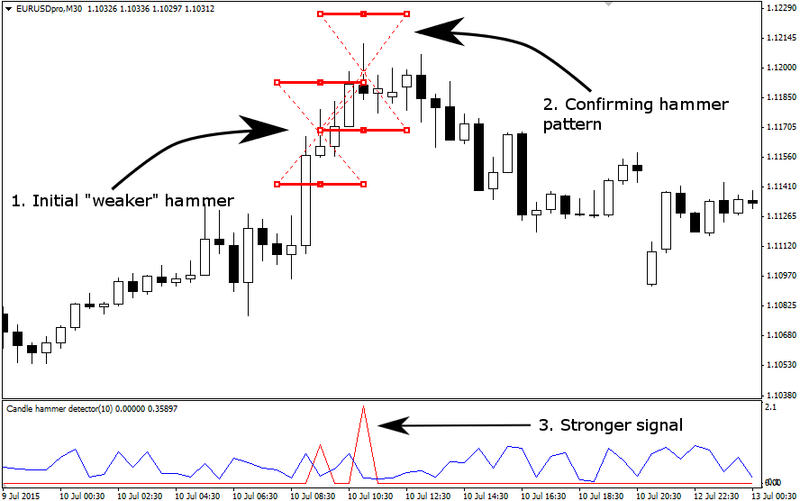 The signal falls when there are a series of bullish hammers which are usually seen in a down trend. The market is potentially reaching “overbought” when there’s a series of shooting stars without a correction. These usually occur in an upward trend. The accumulator line will increase in this situation because each bearish pattern counts as a failed reversal. In a down trend the reverse happens. Each bullish hammer decreases the signal. So a series of bullish hammers without a correction will push the accumulator line downwards indicating that the market is reaching an oversold state. The greater the absolute value of the accumulator line, the more extreme the market position is considered to be. The direction and steepness of the slope is a measure of momentum. 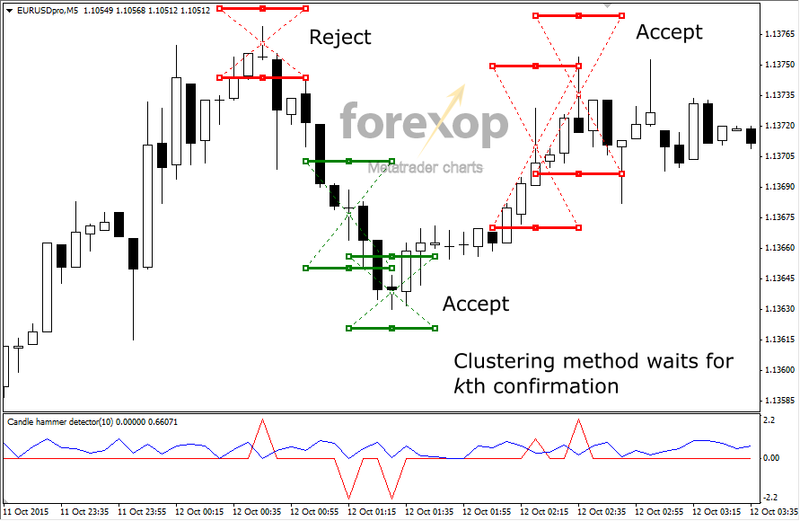 When trading on hammer signals the accumulator can be useful. It gives an idea of trend strength and the likelihood that a hammer will actually result in a reversal or be a fake signal. Extreme valuessuggest that more of the hammer signals have been fake and have not preceded a reversal on the scale being examined. It also suggests that the market is reaching a “more unbalanced” position in being either overbought or oversold. The accumulator can filter out weak or ambiguous signals. For example, bullish hammers appearing when the overall trend is strongly bearish. Or when bearish hammers appear in a strong uptrend. In both cases, trading against the trend may be too risky without further confirming signals. For examples see the figures above. Figure 5 shows the raw accumulator (summation of hammer signals). Figure 6 shows the smoothed line. Smoothing is used to filter and reduce noisy signals. This is helpful to get a “perspective” on market direction and how it is changing beyond that given by an individual hammer signal. As an example see Figure 7. 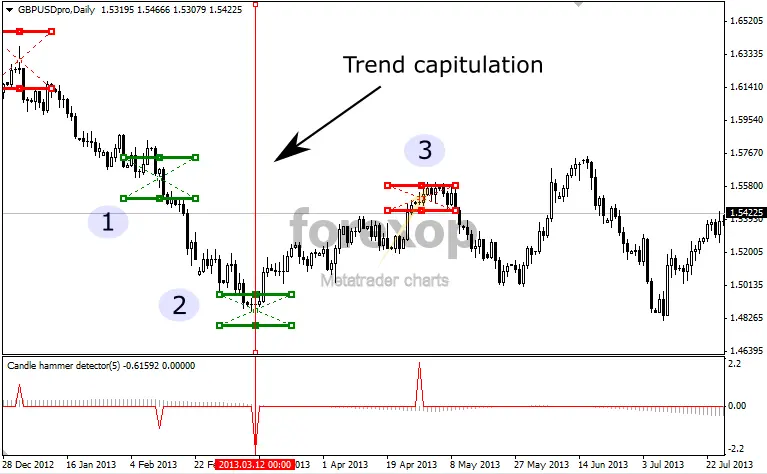 The strong buy signal and the accumulator line suggest that the downtrend is capitulating. Shortly after, a clear upwards breakout happens. Following the break two “fake” bearish hammers appear as the market becomes “uncertain” of the next direction. Notice that both of the sell signals are much weaker than the initial buy signal. Meanwhile the rising accumulator line suggests that the trend is up and reversal hammers are appearing. The fourth hammer is a strong sell signal. Entering short at this point (and the previous one) would actually result in a small profit. The strategy would normally choose to avoid these “sell side” entries based on the fact that the signals are suggesting a strong upwards breakout is taking place. The fifth and final hammer indicates another buy signal, at which point the breakout enters a second wave of upwards momentum. Hammers and shooting stars will often appear when the market is briefly correcting rather than changing direction. In some cases, these signals can result in profitable swing trades. The following example demonstrates. In Figure 8, the overall trend is upwards, but within this trend, four bearish signals appear. The first and last indicate strong sell signals, and would actually result in an acceptable risk/profit ratio. The hammer strength confirms these as sell entries despite the upwards trend. On the other hand, the middle cases (#2 and #3) are ambiguous. The strength is weaker which suggests these may not be viable entry points. Given the current uptrend, these would be filtered as below threshold. Finally, the fourth pattern produces a strong sell signal and this does indeed precede a deeper retracement. 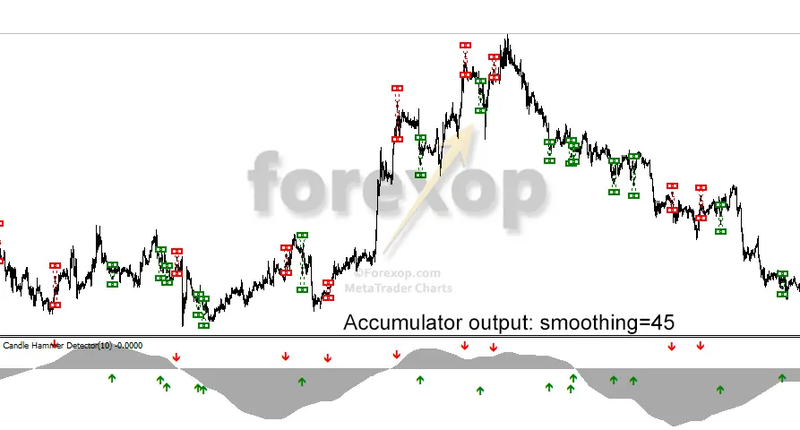 The accumulator line and the strength of the hammer are used to determining this and to separate between signals that are likely to mark the end of a trend or a just a swing. Very often, hammers don’t appear in isolation. They appear in pairs, or sometimes even in large, messy clusters. One of the challenges of trading on price action signals is dealing with this kind of “noise”. Using filtering we were able to reduce the frequency of double (and triple) hammers to around 1 in 20. In the cases where double hammers do appear these can be used as confirming signals. Often the first hammer to appear is the weaker of the two and is followed by a stronger signal in the next few bars (see Figure 9). 1. Lot weighting method: If a strong hammer is detected (above threshold) this method looks back over a set bar range to see if a pair occurred. The bar range is usually set between 2 and 10 bars at the current chart period. If a previous hammer occurred, the second signal is used to increase the holding volume. With this method, the stronger signal is usually given a higher lot weighting. For example if the signal strength is double, then twice the lot weighting is used. 2. Clustering method: The clustering method assumes that “real” hammers will nearly always be preceded by one or two fake signals. An entry is made after the kth signal. For example, with k=2, the entry is only made after two confirming hammers appear in the same direction over the bar range. This method will result in far fewer trades, especially if strong filters are used to remove noisy signals. For example, in Figure 10 below with k=2, the first signal would be ignored. But a buy would trigger at the first pair, and a sell at the second pair. In both cases the entry would trigger on the later hammer signal rather than the less profitable first. 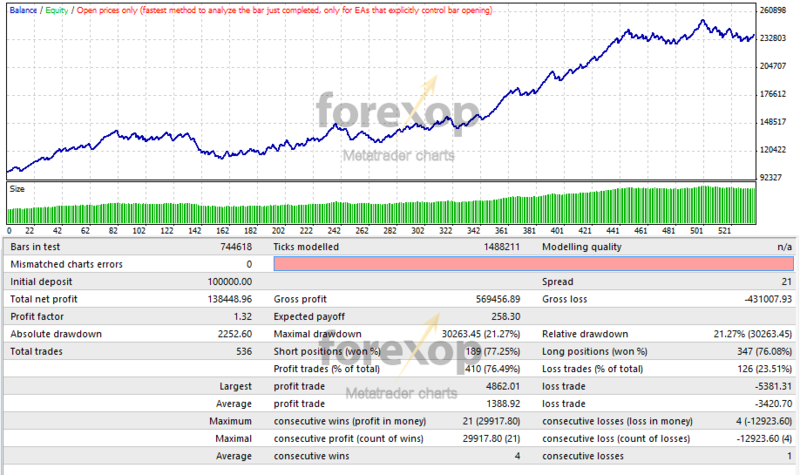 The EURUSD run resulted in 595 trades a profit factor of 1.3, and a total profit of USD 85,849.50. 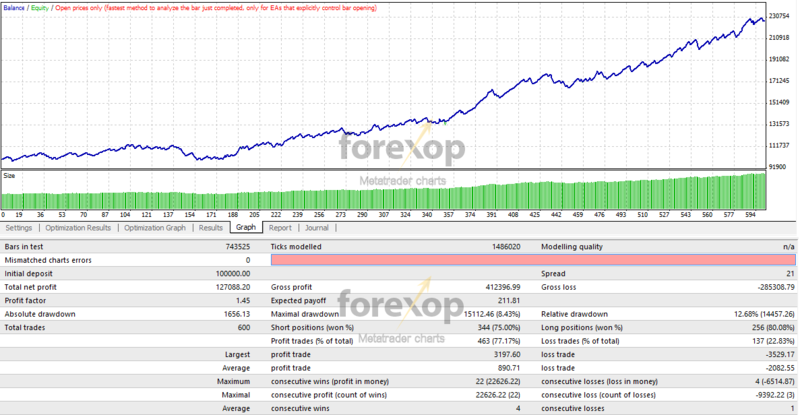 USDJPY run resulted in 600 trades a profit factor of 1.45, and a total profit of USD 127,088.20. 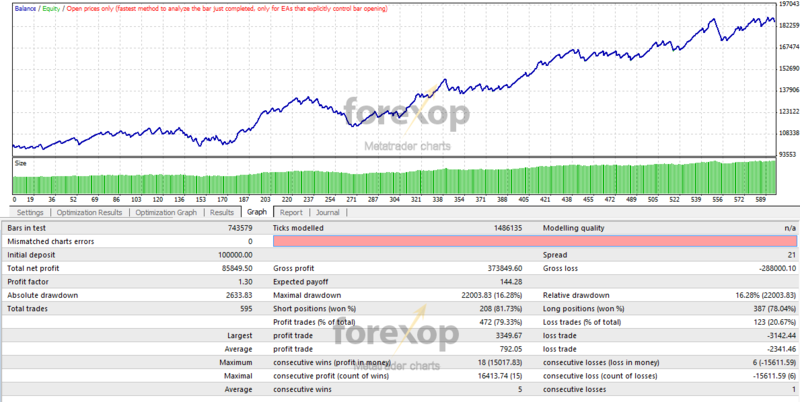 GBPUSD run resulted in 536 trades a profit factor of 1.32, and a total profit of USD 138,448.96. As a comparison, the same test was run but using the unfiltered hammer signals: That is trading on every candidate hammer that appeared on the chart. This resulted in a loss of -USD 8,154.25. Similar results were achieved on the other pairs. This suggests that trading on “unfiltered hammer” signals is unlikely to produce a successful strategy over the long term. 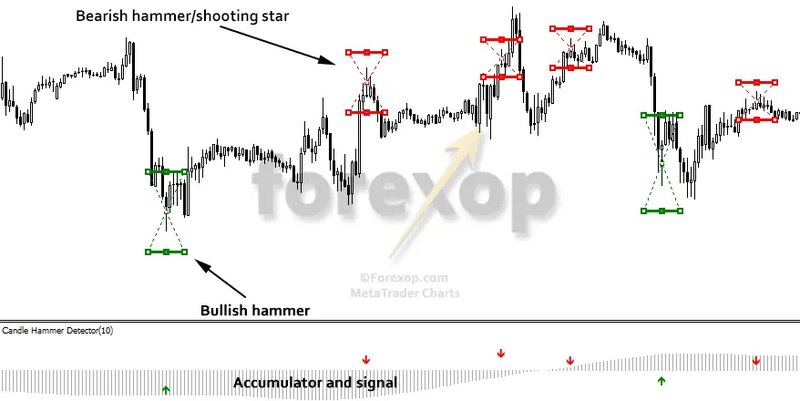 Hammer and shooting star candlesticks are useful trading signals as well as being easy to understand. Their properties make them ideal for a variety of scalping and day trading strategies. These types of signals tend to be “noisy”. The main difficulty in implementing hammer strategies comes from separating these noisy and ambiguous signals from real ones. Systems that traded on raw hammer signals tended to perform poorly in tests over the longer term (click to open graph of unfiltered result). I’ve shown several methods for dealing with these problems in this article. The hammer strategy was shown to produce profits under various market conditions of which trend followers and other systems based on lagging indicators can fail. I just purchase the full version of the hammer. What’s pairs and time frame do you recommend? Should I keep trend 10 accumulator period 30 ? It’s possible for feature you have a notification pop-up. Thanks for the suggestion about the popup: There is a sound alert that can be switched on. Yes the demo version will display the hammers on the chart but it doesn’t create the numerical outputs. Which pairs are you trading?